The evolution of budget revenues and unpaid taxes are among the main topics of discussion in the context of Greece's fiscal consolidation but are also often open to misinterpretation. In 2015, a year marked by political turmoil, lengthy negotiations with the institutions on the third bailout programme, the imposition of capital controls and the consequent economic downturn it was broadly expected that budget revenues would miss their targets. 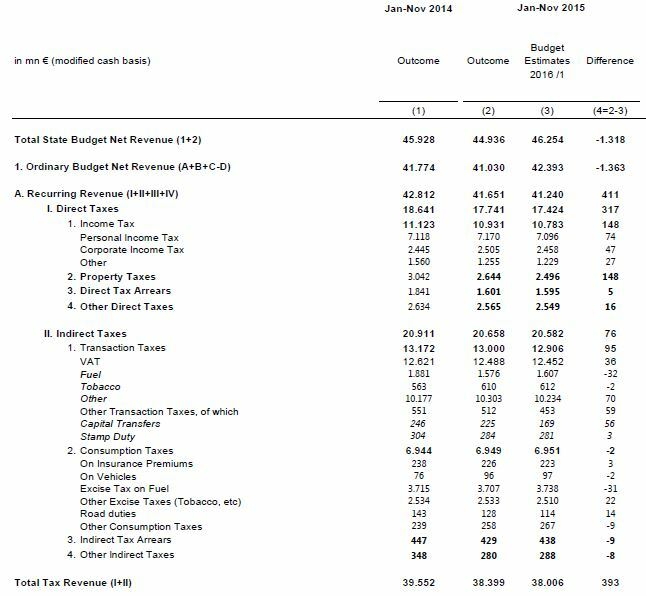 Indeed, the latest budget execution bulletin showed 11-month revenues (before tax refunds) reached 43.4 billion euros, which was 1.44 billion short of the target. This is the headline figure that was widely communicated by most media and prevailed in the discussion about this particular issue. The conclusion of most commentators was more or less similar, pointing to another year of weaker than anticipated revenue collection. However, a closer look at the revenue breakdown reveals some interesting findings that alter the initial impression to a great extent. Direct taxes reached 17.74 billion euros by November, beating their targets by 1.8 percent (317 million euros). Income tax was 1.4 percent (148 million) above the target, with both personal and corporate income tax over-performing. Similarly, property taxes beat their target by 5.9 percent, which in absolute terms corresponds to a similar outperformance of 148 million. At the same time, indirect taxes stood at 20.66 billion euros, which was 0.4 percent (76 million) above the target. Transaction taxes beat the target by 0.7 percent (94 million), while consumption taxes were almost exactly where they were expected to be. 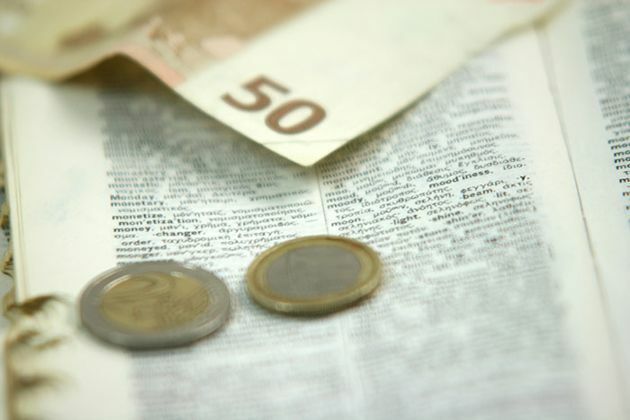 Overall, total tax revenues reached 38.4 billion euros in the 11-month period. This means they exceeded their target 1 percent or 393 million. The evolution of tax revenues in the preceding months of 2015 displayed an underperformance that peaked at 3.33 billion euros at the end of August, when direct and indirect taxes were 2.3 and 1.03 billion short of target respectivley. For direct taxes in particular, this was primarily attributed to the delayed payment of the first instalment of the personal income tax and the postponement of the first instalment of the single property tax (ENFIA). The former was initially due in July but for the majority of taxpayers it was extended until August, while the latter was actually due in October instead of the initially scheduled July. In 2014 the first instalment of both taxes was paid in July. In the following months, the underperformance of tax revenues was trimmed to around 300 million euros by September and October before turning to an over-performance by November. The discrepancy caused by the change in the income tax and ENFIA payment schedule is also evident in the comparison of the monthly gross revenues this year vis-à-vis the corresponding figures of the previous year. The importance of the first instalment of income tax and ENFIA on revenue collection is clearly displayed in July 2014, when revenues peaked at 6.04 billion, which was by far the highest monthly reading in 2014. Also in 2015, the highest revenues were recorded in July (5.25 billion) and October (4.69 billion) when the first of instalment of income tax and ENFIA were due respectively. It should be pointed out that since 2014 a large number of taxpayers pay income tax and ENFIA via credit cards in 6-12 monthly instalments. However, the state receives the whole tax upfront, which explains the inflated revenue collection in the first payment month of both income tax and ENFIA. Since tax revenues outperformed the targets, why does the headline revenue figure show an underperformance? The answer largely lies with a non-recurring revenue item, SMP and ANFA income, which stood at just 291 million euros in the 11-month period versus target of 2.16 billion, implying an underperformance by 1.87 billion. It is noteworthy that the SMP & ANFA income of 291 million euros was received in February and that was the first and last time Greece received this source of income in the course of 2015. Summing up, recurring revenues, primarily made up by direct and indirect taxes, exceeded their targets, while SMP and ANFA income, the largest component of non-recurring revenues, was the key reason for the total revenue underperformance. An important indicator related to revenue collection is the evolution of tax arrears. Tax debt is created when a tax is not paid on time. It corresponds to the unpaid tax plus any penalty and surcharges. According Finance Ministry figures published last March, the amount of total overdue taxes stood at 76 billion euros at that time. Of this, 46.6 billion- or more than 60 percent - had been created over the previous five years. Based on the same figures, more than 3.7 million taxpayers (3.33 million of which were individuals) owed less than 5,000 euros each. The cumulative outstanding overdue taxes of this category stood at 2.3 billion euros, making up just 3 percent of the total amount. On the other side, 80 percent of the outstanding tax arrears’ amount was owed by 6,500 taxpayers that had unpaid tax obligations of 60.4 billion. It should be highlighted that that tax arrears are created even if tax revenue collection is on track as revenue targets are usually based on a collectability rate on each specific tax due. As an example, the annual ENFIA target is set at 2.65 billion euros. This corresponds to a collectability rate of around 80 percent of the total nominal ENFIA of 3.3 billion. Thus, even if the actual revenue collection from ENFIA reaches the targeted 2.65 billion, tax arrears of 650 million would be created. This corresponds to 20 percent of ENFIA that was due but not paid. Since the beginning of 2015, the General Secretariat of Public Revenues (GSPR) has been disclosing the effective new tax debt, which broadly relates to the part of overdue taxes that is theoretically collectable. According to the GSPR methodology, effective tax debt mainly excludes from the gross figure the unpaid taxes of public enterprises, municipalities and defaulted companies. The evolution of the effective tax arrears provides a better indication of the amount of overdue taxes that could be collected via settlement or if taxpayers have greater liquidity when the economy recovers. In the 11-month period of 2015, effective new tax arrears reached 7.21 billion euros, corresponding to around 61 percent of the gross tax arrears of 11.83 billion that were created in the first 11 months of last year. This means that although tax revenues met their target for January to November 2015, mounting (effective) tax arrears continue to erode revenue collection and highlighting that a large number of taxpayers, particularly households, have exhausted their ability to meet their obligations. The truth is that for 2015 Greece scored some record current account surpluses. To be in the month of October and still have a current account surplus is unheard of in the post '74 Greece.